Oh yes, someone is going to feel the love when they get this romantic Valentine’s Day (or anytime!) gift. 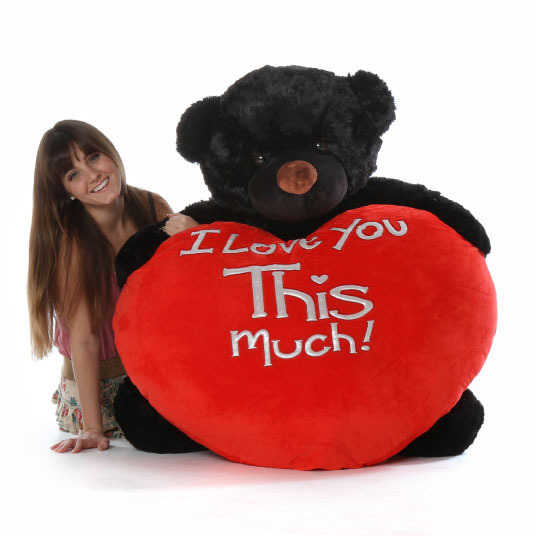 Meet Juju Cuddles, our huge 4ft (48in) black teddy bear, holding a jumbo plush red heart. Juju Cuddles is adorable, with the softest plush midnight black fur you’ve ever felt. He is a tubby, huggable teddy bear with warm brown eyes, a big smile on his face and a soft chubby brown nose. He’s holding our exclusive Giant Teddy brand jumbo plush red heart(Will not be attached [sewed] to bear) with the message, “I love you THIS much!” embroidered on the front. When you want someone special to know how BIG your love for them really is, this life size Valentine’s Day teddy bear is the perfect choice.